Create the right atmosphere throughout every part of your home or business with new hardwood flooring. At our local expansive showroom, we proudly feature a wide variety of material options for customers throughout the region. Whether you are looking to upgrade your bedroom, living room, or another part of your building, you can count on us to deliver the right options for each of your needs. Our wide selection of options includes different styles, colors, finishes, and grains. From engineered hardwood flooring to solid hardwood floors, our inventory includes unlimited products to choose from. Shop with us today to make the right choice for your home or business. Count on our store for competitive prices on hardwood planks. We purchase flooring in a strong and influential buying group so we can find the best brands and prices for the benefit of our customers. We have Mirage, Shaw, and TRC brands samples. You can come into our store to shop or let us bring the store to your home or place of business. As part of a free design consultation, we visit our customers, carrying armloads of flooring samples, so you can match hardwood to your decor. With so many options available you are sure to find the floors that perfectly match your aesthetic preferences, lifestyle, and budgetary restraints. While hardwood floors are a popular option for most homeowners, they may not be the right material for every room. If you are looking to upgrade your basement, bathroom, or another moisture-prone area, it is important to choose a material that stands up to water. As stylish as other wood floors, engineered hardwood delivers a stunning look in a series of different colors and styles. Engineered hardwood flooring may be for you if you enjoy a more luxurious look, but a lower price. This budget-friendly material also supports the green movement by offering eco-friendly options for your home. When you are ready to upgrade the look of your home or business, choosing a new set of flooring is an easy way to make a big impact. Whether you are looking to perform a complete remodel or a simple upgrade in your space, you will find everything you need at our local showroom. Our selection of wood floors includes top material options in a series of different styles and designs. We are available to work with you to find the perfect material for your space. Solid hardwood flooring gives a timeless look to any home or business. Whether your personal style is rustic, contemporary, modern, craftsman, traditional, Victorian, bungalow or other, solid you can’t go wrong with hardwood floors. These materials offer you a way to enhance your space with a style that fits your tastes. Due to its durability and long lifespan, a solid wood floor is one of the most coveted options available today. 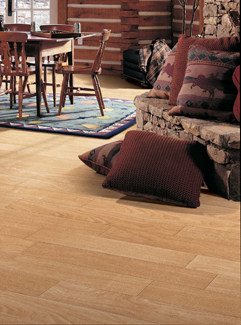 When solid wood planks show signs of wear and tear, you do not have to replace your flooring. All you need to do is have the floors refinished. In fact, you can have solid wood refinished several times during the life of your flooring, which can last for as long as a century. Solid wood flooring is an investment in your home that brings the beauty of nature indoors. Make a statement about your home or place of business by installing new floors in every room. Our local flooring store offers a handsome selection of the species, grain, and gloss that you prefer. We invite you to browse our spacious showroom and find that we offer flooring prices that fit with every budget. Hardwood floors add value to any home and add wonderful character. Consider these products when renovating any room in your home. These beautiful materials are available in a series of different style options. No matter what your personal tastes are, you are sure to find something you love when you shop with us. During your visit to our showroom, feel free to ask our design and sales professionals to show you different brands and finishes. We are confident we have exactly what you need to elevate your design aesthetic. A professional install actually boosts the value of your property, no matter what material you choose. A hardwood flooring installation is a job best left to the professionals, as this material can be difficult to install the right way. When you work with us, you can count on our team to perform your project the right way the first time, saving you from spending hundreds on repairs in the future. Before they lay a single plank of hardwood, our installers make sure the flooring surface is clean, dry, and level. Your hardwood planks are then placed piece by piece with attention to the grain and pattern. The installation specialists make sure that each piece adheres securely to the subfloor so that individual planks cannot move about. Any movement pushes against other planks and subjects your flooring to damage, such as cracking and breaking. Besides making your flooring surfaces look elegant, professional installation provides needed protection. Expect your wood planks to arrive three days before the actual installation. This gives the wood a chance to adjust to the humidity levels of your house. These professionals account for the minute expansions and contractions of real wood during the installation process. They place spacers between the planks while working on your flooring and give a tiny bit of breathing room at the outermost edges of the room. Contact us today for help in choosing the species, grain, and finish of hardwood flooring for your home or business. We proudly serve Lethbridge, Claresholm, Cardston, Raymond, and Magrath, Alberta, Canada, and the surrounding areas.